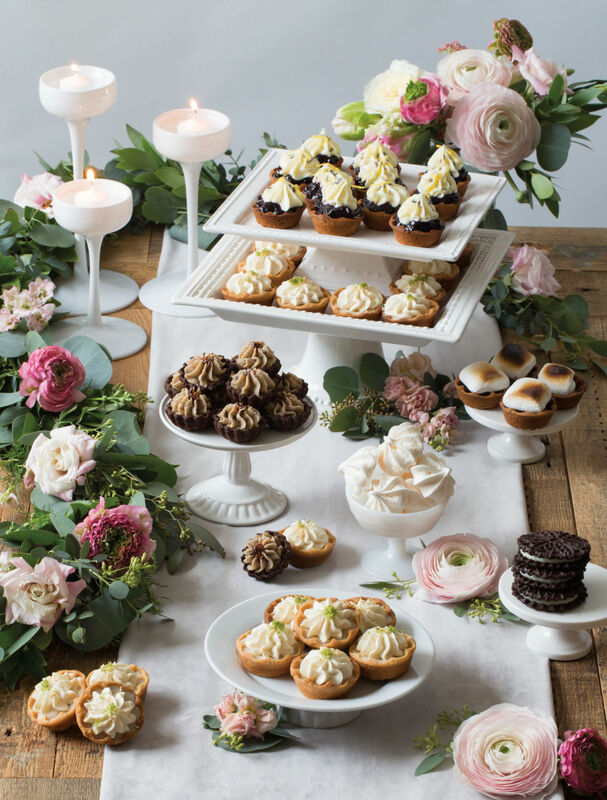 Divine wedding cakes, cookies, and pies from popular Portland bakeries and confectioners that reflect your own style on your sweetest day. For a minimalist vibe with an art gallery impact, we swoon over the work of Sara Stringer from Salem’s Country Cake Shop. 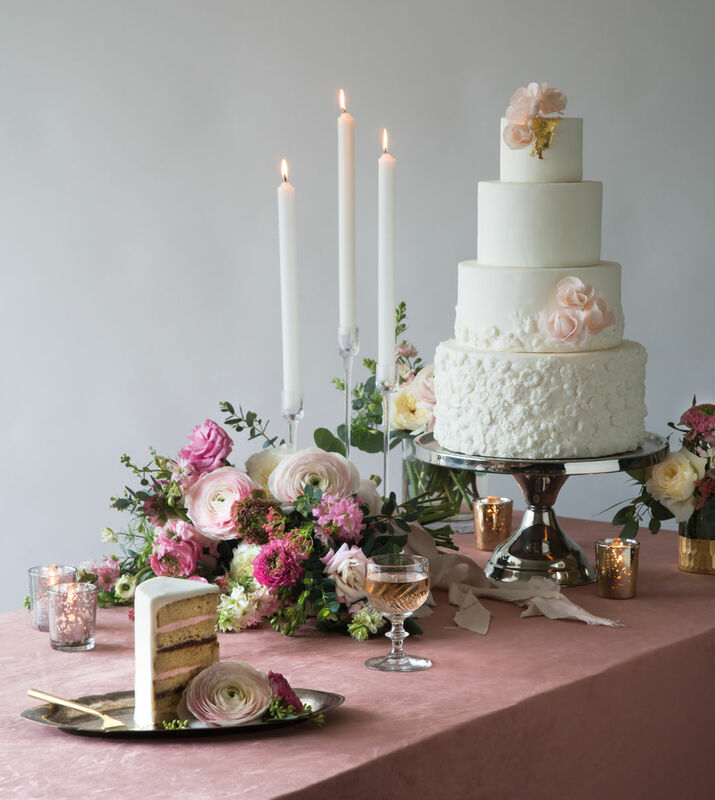 For this masterpiece, Stringer molded and hand-sculpted bas-relief detailing over the entire bottom tier and sent it trailing up to the second tier, and topped the cake off with a patch of shimmery gold leaf and handmade sugar flowers dusted in pale pink. 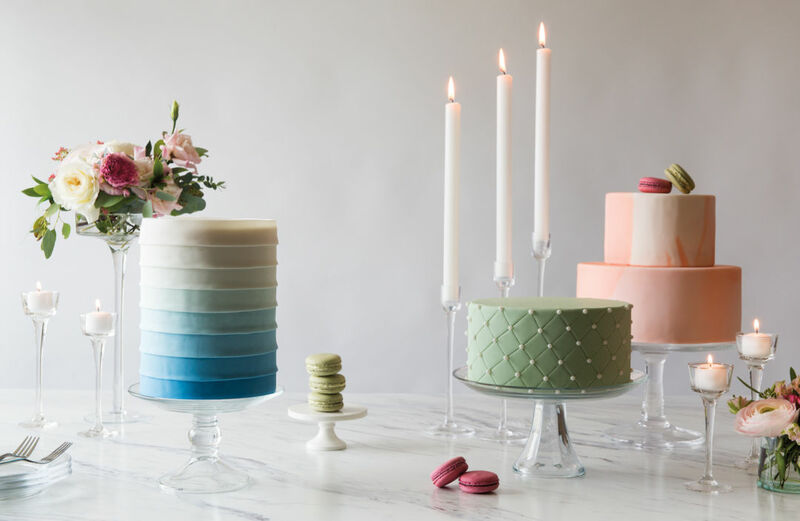 “Don’t be afraid to go crazy with design and texture,” Stringer says, “but keep the color calm and minimal.” The confection is a pecan cake layered with salted caramel Swiss meringue buttercream and chocolate Bavarian cream. Ali Briskey of Ali Briskey Designs gathers romantic blooms of soft larkspur, pink lisianthus, Italian “Clooney” ranunculus, and creamy David Austin “Patience” garden roses with gunni eucalyptus and local Peterkort pon pon ranunculus to bring an added dimension to this textured table spread. Metal pedestal and mercury glass votives from Barclay Event Rentals. Cut-crystal goblet, antique silver cake plate, gold cake fork, and tall glass candlesticks from CK Wedding & Event Design. Velvet Collection ultra- luxe sueded table linen in blush from La Tavola. Lucky for us, her trio of cakes are anything but, including (from left to right) a lemon cake filled with blueberry buttercream and lemon curd covered in a thin layer of house-made fondant and then wrapped in bands of fondant in an ombré design; chocolate cake with salty caramel buttercream and chocolate ganache covered in a thin layer of fondant and styled in a quilted pattern; and pink champagne cake with strawberry buttercream and strawberry jam covered in a thin layer of marbled fondant. “We love macarons at a wedding!” says Forcum. “They are the perfect way to bring pops of your wedding colors into dessert displays or onto the table for favors. Modern and sophisticated, they’re such a perfect touch.” Sink your teeth into these jewel-toned gems in red raspberry and pistachio by Farina Bakery. Briskey’s modern floral design focuses in on the David Austin garden rose and blush lisianthus, with soft floating lines of seeded eucalyptus and pon pon ranunculus lending a pop of color and texture. Glass pedestals from Barclay Event Rentals. Small white pedestal from Vintage Meets Modern. Glass candlesticks, glass dessert plates, and modern silver forks from CK Wedding & Event Design. A lavishly delicious dessert spread? Don’t mind if we do! Annie Portlock of AnniePies bakes up a storm in her Southeast Portland kitchen, turning out inventive, crowd-pleasing favorites like a s’mores pie and homemade Oreos. 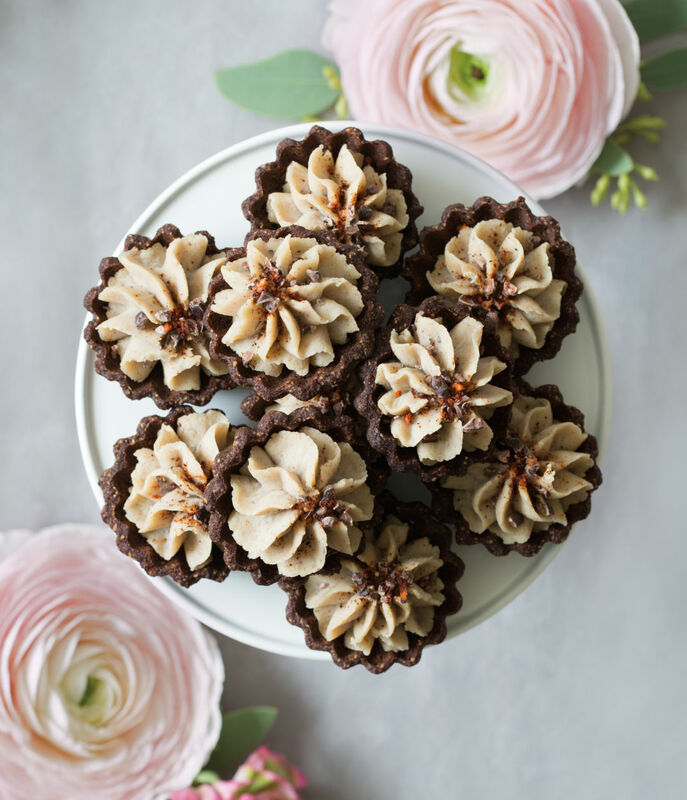 “Mini pies are a fun, festive, less traditional wedding statement,” Portlock says. “It’s not a cupcake or even a traditional pie, and they’re easy to serve with no cutting or even plating required.” Her one piece of caution? “Do not order more than three flavors or people will assume they can try all of them, and they’ll disappear!” Forcum found equal inspiration in the spread. “Big dessert displays bring an incredible opportunity to really show off your personality and style,” she says. Ali Briskey adorned her myrtle and eucalyptus garland with fresh spring blooms, highlighting the dramatic Italian ranunculus. Assorted white pedestals from Vintage Meets Modern. Tall white candleholders from Barclay Event Rentals. Velvet Collection ultra-luxe sueded table runner in Steel from La Tavola. S’mores pie; honey lime coconut pie; Le Chocolat Framboise pie; blueberry lemon lavender pie; Dear Frida (vegan and gluten-free) pie with spicy chocolate paleo crust, banana coconut kahlua mousse, cocoa nibs, and chile salt; homemade Oreos; and homemade meringues.